﻿﻿ Well it's not me carrying off the $US20,000 in cash and a set of Whise Electrostatic studio speakers valued at $US17,000 tonight unfortunately. 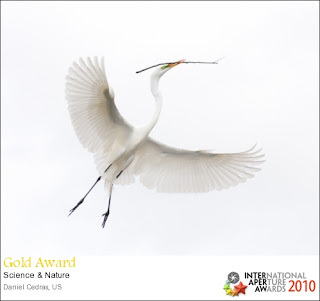 Daniel Cedras of Florida is the lucky winner of this year's open award with his photo of an egret in flight on a white background. My 4 entries all garnered bronze awards.